Ten PMQG members participated in the Charity Sew Day at Modern Domestic on Thursday, January 30. 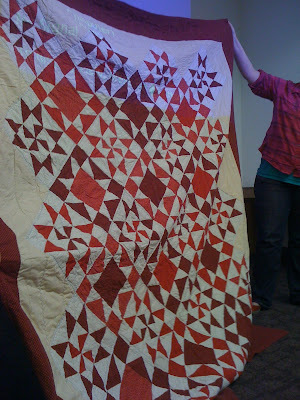 We made enough of these fun wonky stars to complete a top! 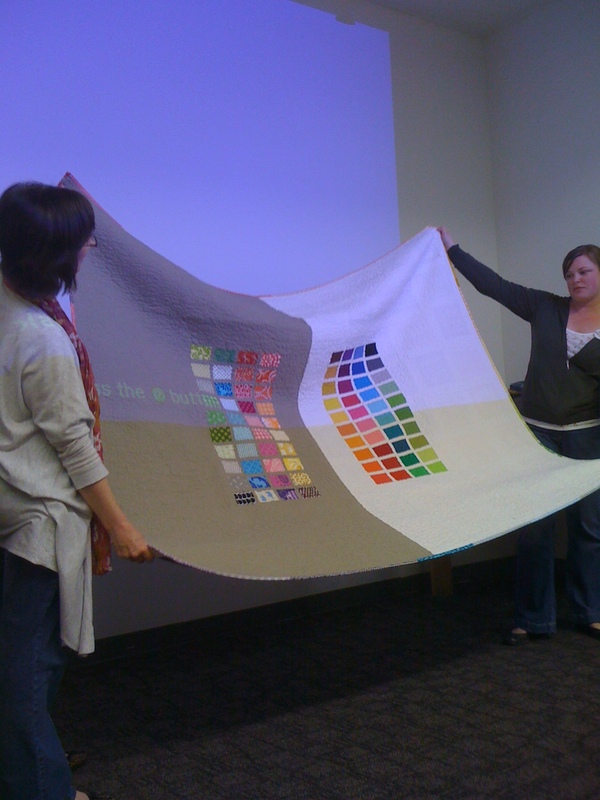 (Never fear: there are more, and this isn't the actual layout.) 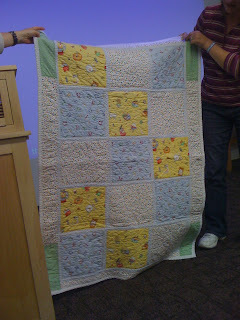 Cath will finish the assembly and quilting, and then we'll give it to Camp Erin, which serves children who are grieving. Do any of these blocks look familiar? Michelle brought in this top, which she assembled from some of last year's Block of the Month donations. Dramatic! Michelle also recently pieced this lively top from some more donated blocks. 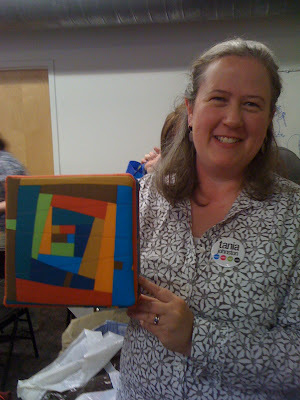 Meanwhile Gail spent the day sewing these tumblers from pre-cut material that was donated to the guild. 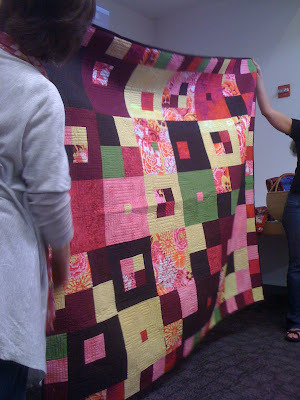 The photo doesn't do it justice! 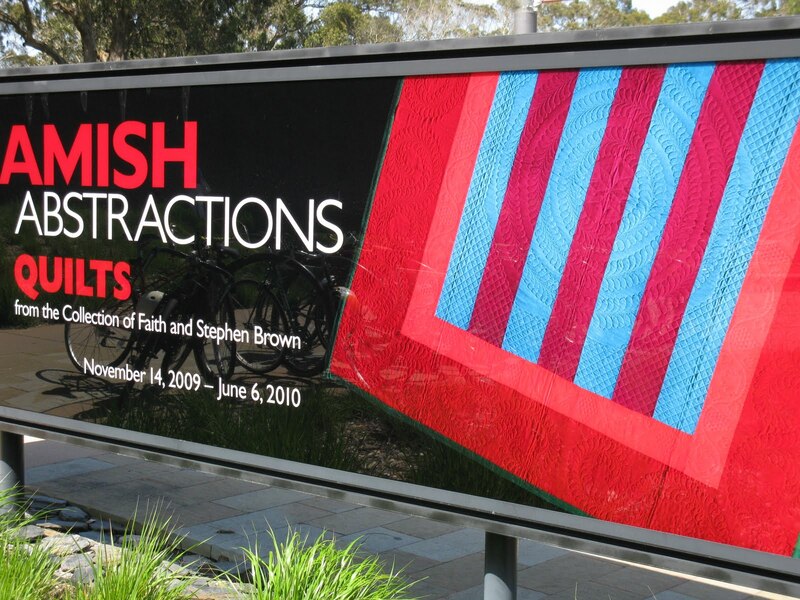 Pretty impressive! 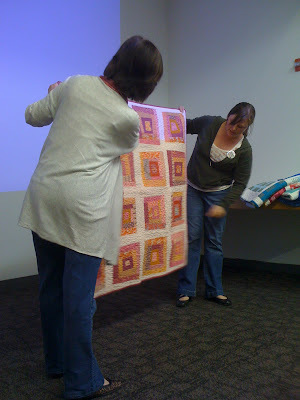 But what's more impressive is how much fun everyone had. 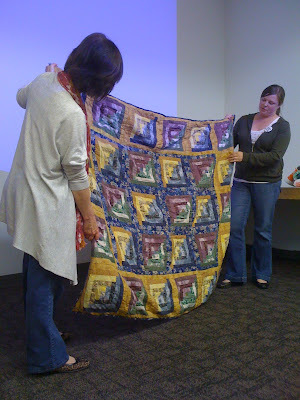 Charity sewing is a great way to learn new skills, meet new people, and practice sewing in a low-pressure environment. 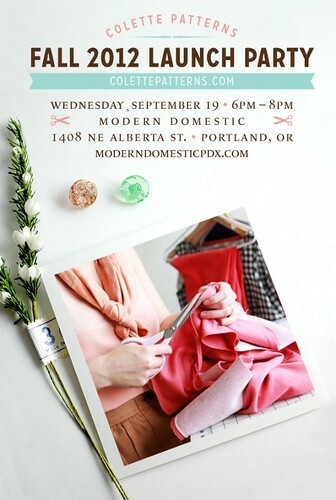 We hope to see you at the next Charity Sew Day! 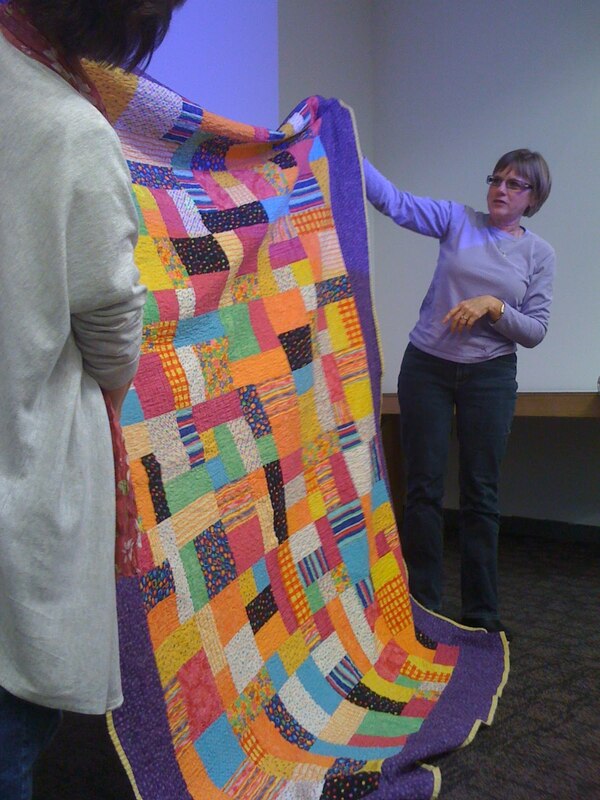 Portland may have experienced more than the usual amount of rain this Spring, but it does not seem to have dampened the spirit or creativity of the Portland Modern Quilters. 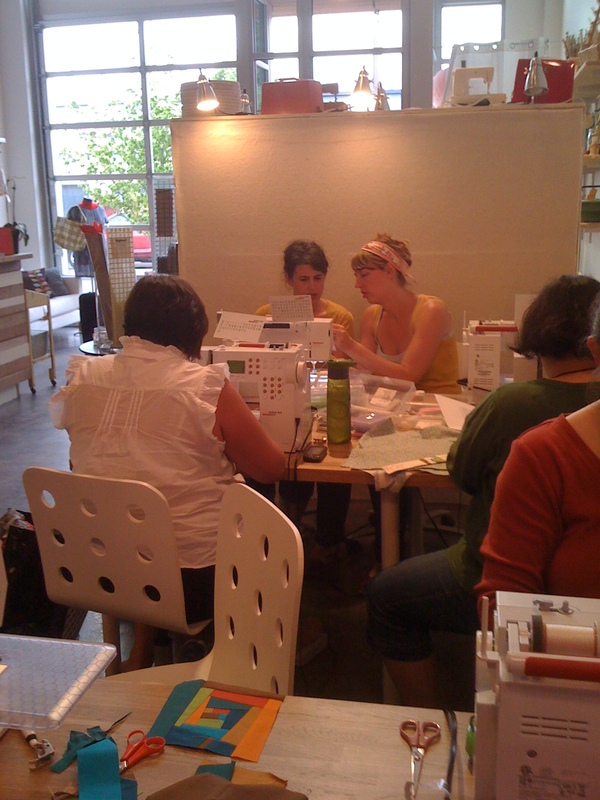 And the weather was very pleasant for our June Sewing Night at Modern Domestic at the beginning of the month. Lupine of Modern Domestic assists Tamara with a sewing machine. 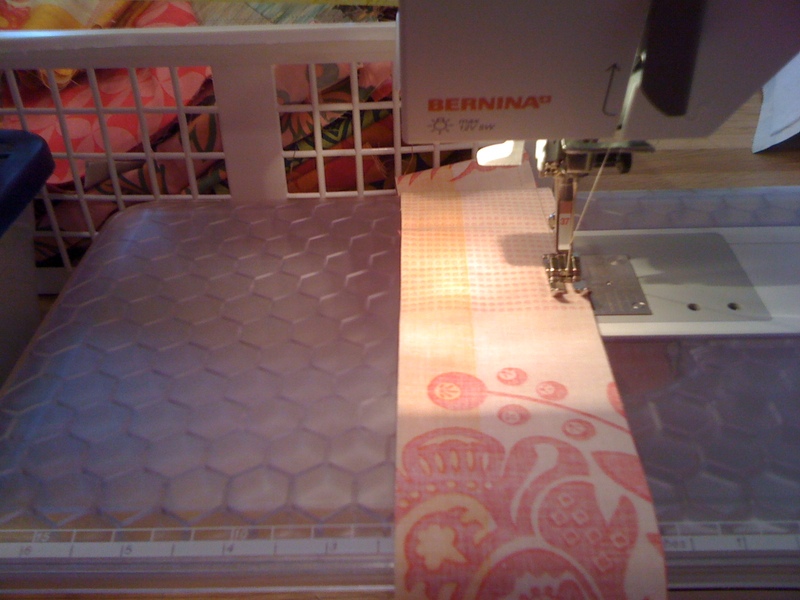 Nothing like new, modern machines -- silent and smooth. We all fell in love with this project started by Tania (more on this later in the post). Bags and totes of all shapes and styles were one of many conversational topics of the Portland Modern Quilters while sewing. Megan brought this project all cut out and ready to go and had a finished bag by the end of the evening! It's amazing what can be accomplished in one PMQG Sewing Night! 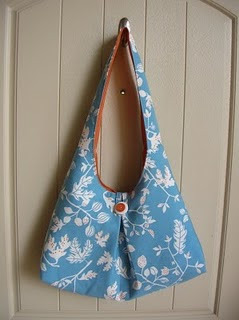 The pattern for the Margaret Bag, designed by our own Elizabeth Hartman, is free and available here. 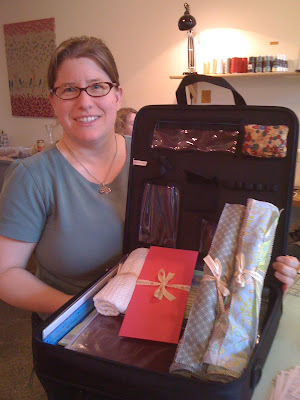 Thank you MD for providing this wonderful giveaway case full of fabric and sewing goodies. 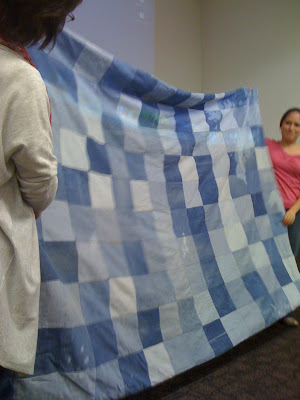 Pacific Northwest College of Art, with 40 members in attendance. 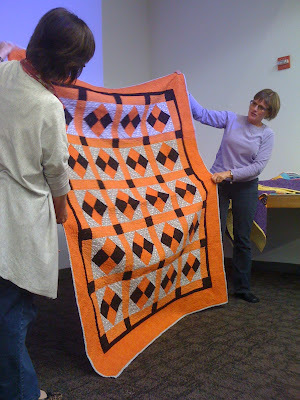 I started the evening off with a presentation on my participation in the Lazy Gal Liberated Amish 2010 Get Together, including my trip to San Francisco in April to see the Amish Abstractions exhibition at the DeYoung Museum. 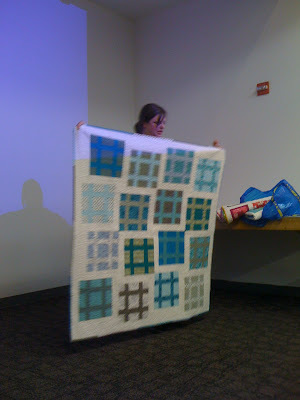 Although one purpose of the presentation was to inform, it was also to inspire and challenge and perhaps shake up our own ideas about what is modern and what is traditional. 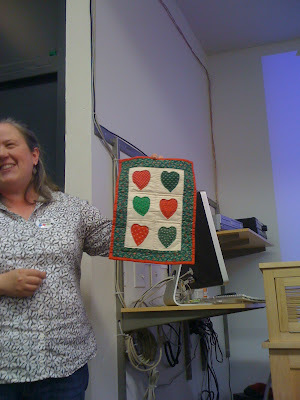 It was a delight to present to such a receptive and interactive audience. 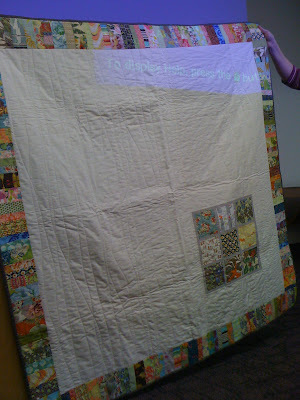 Next up was Violet Craft, sharing pictures from Spring Quilt Market in Minneapolis. 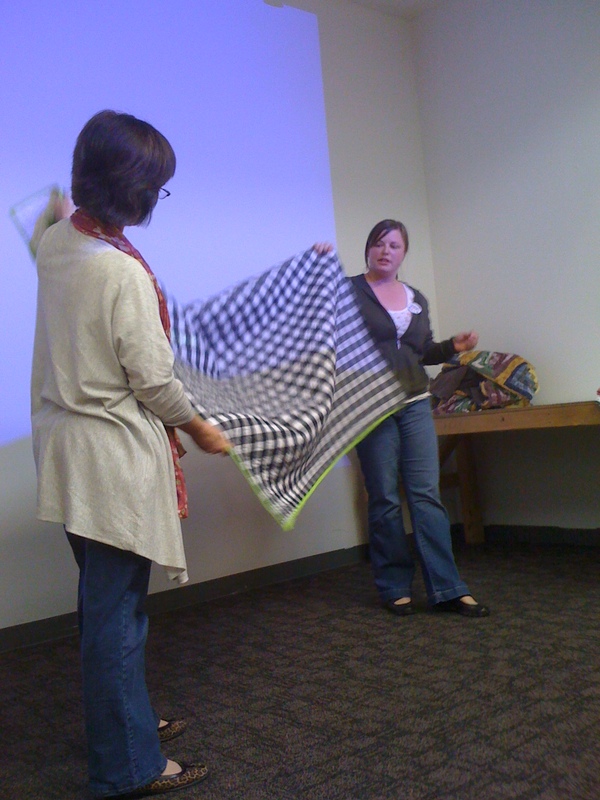 Violet made the trip not as a buyer for her children's clothing line, Kung Fu Bambini, but rather to present her new fabric collection with Michael Miller, which you can look for in early 2011. 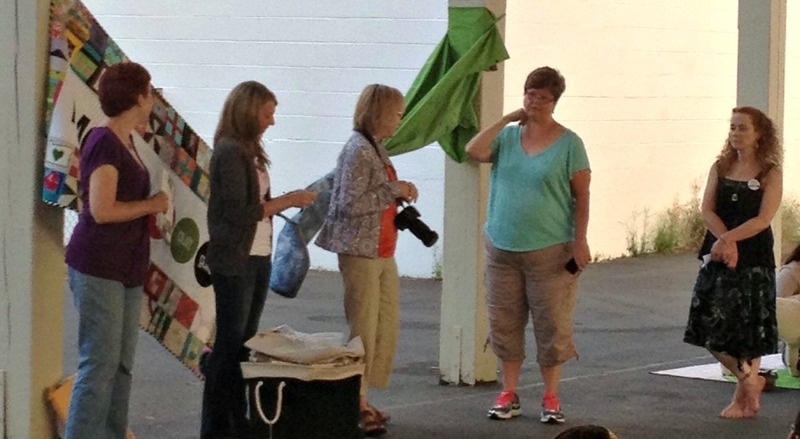 Congratulations, Violet! 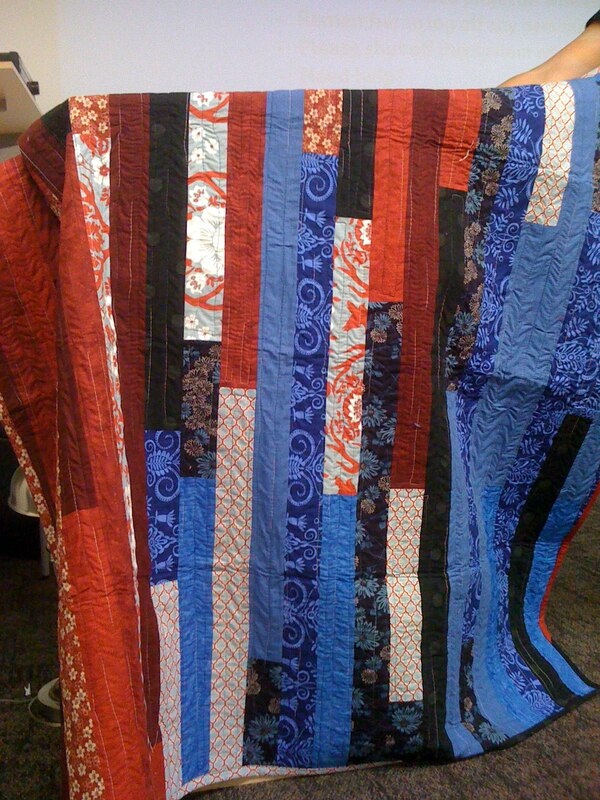 We can't wait to see your name on that selvage! 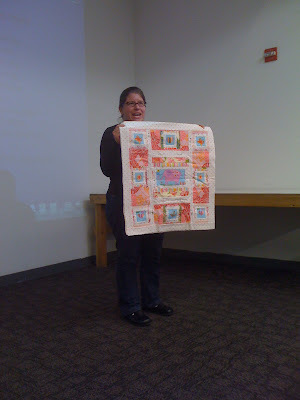 Through Violet's presentation we learned about School Houses and book release parties and saw pictures of booths and quilting peeps, the Market quilt show, and Elizabeth's New Wave and Birch quilts on display. 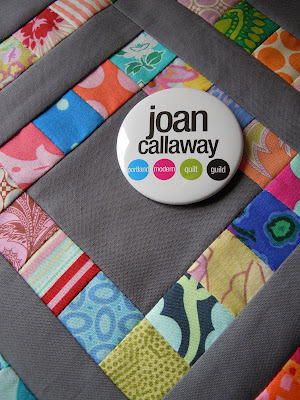 Eye candy galore! Elsa briefly talked about Hobo quilts and showed Hobo blocks. 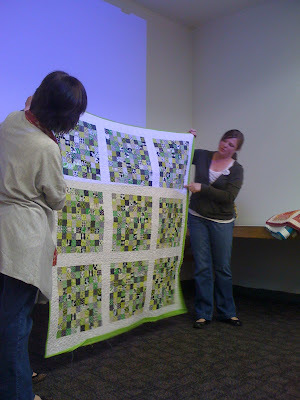 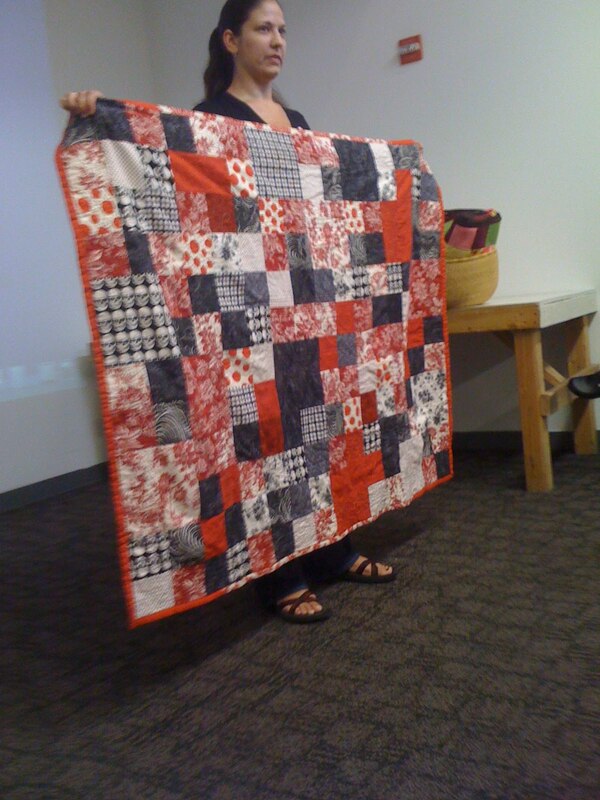 Wendy shared her first quilt and asked for advice about quilting. 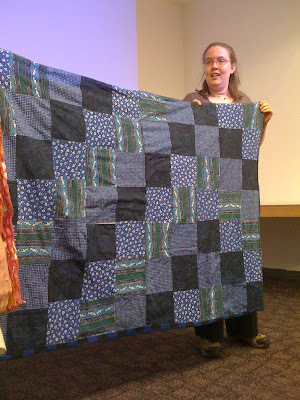 This denim (from old jeans) tied quilt was Michelle's first and remains in use for picnics and camping. Michelle's latest project -- Hello, Kitty! ...and recent project made with charm squares from our May swap. 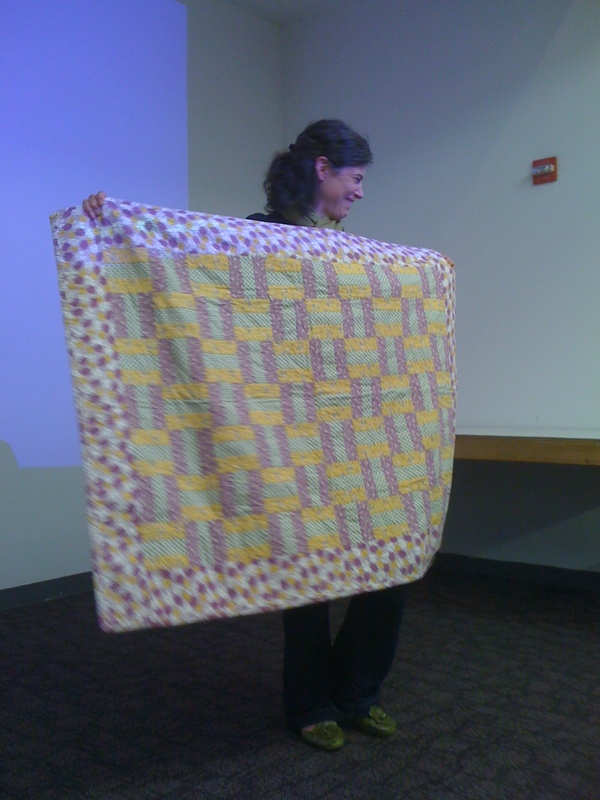 The background fabric and backing are Ikea sheets. Kristin's most recent project, inspired by the Dear Jane quilt. Patty's recent quilt in Oregon State colors for her husband. 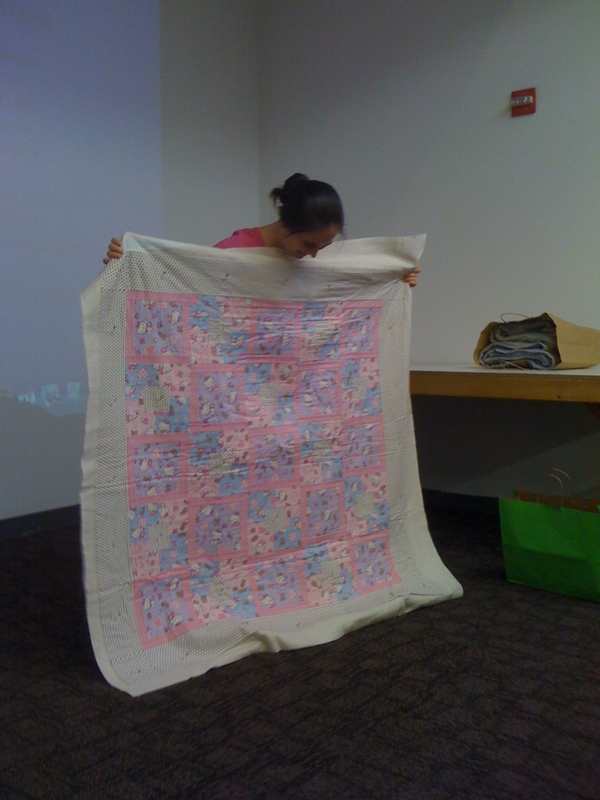 This is Brittany's first quilt, made when she was just 8 years old. She claims she was very stubborn and refused to quilt it or tie it. 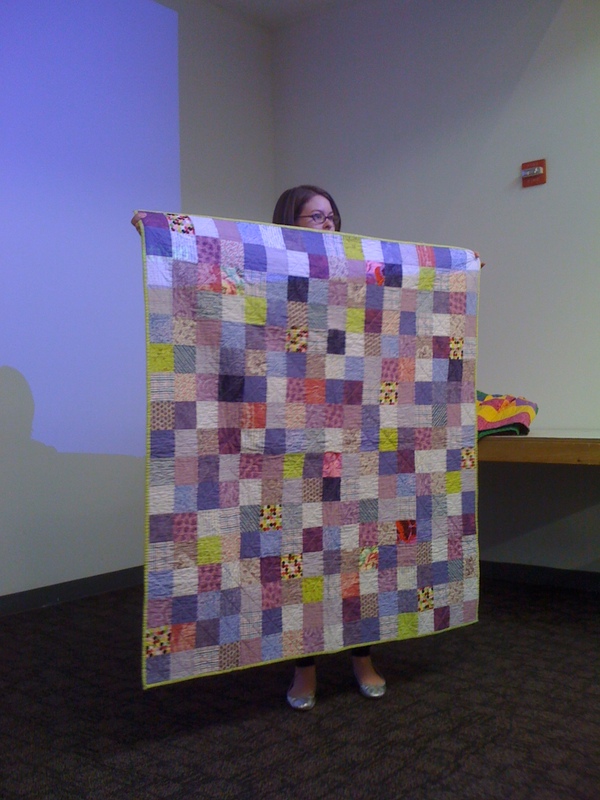 And here is Brittany's more recent Alice in Wonderland project. 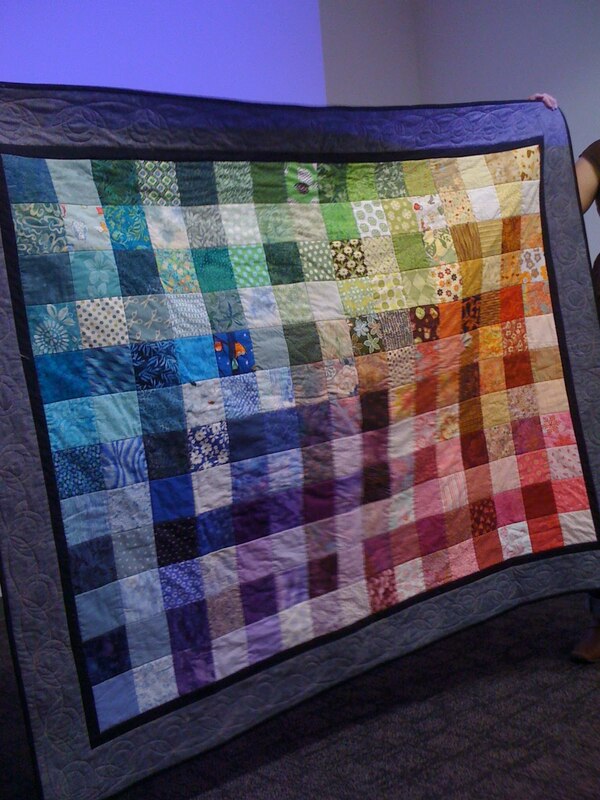 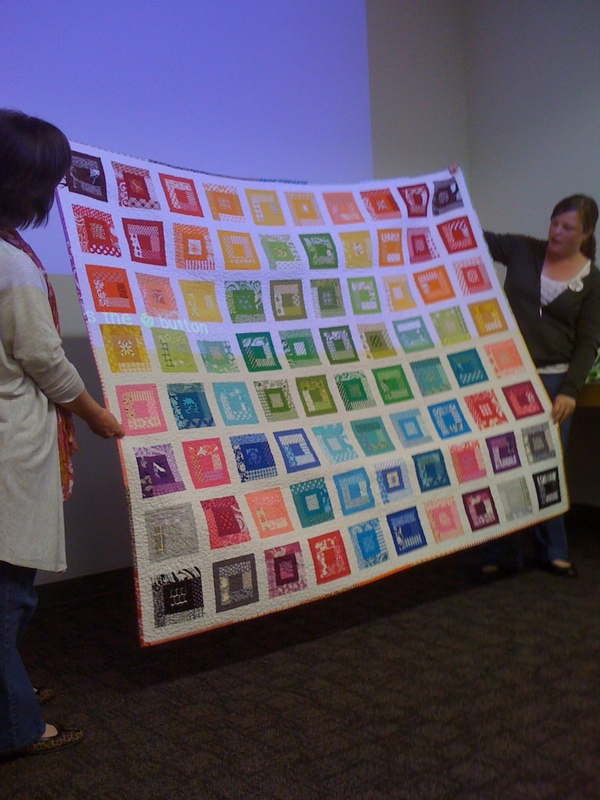 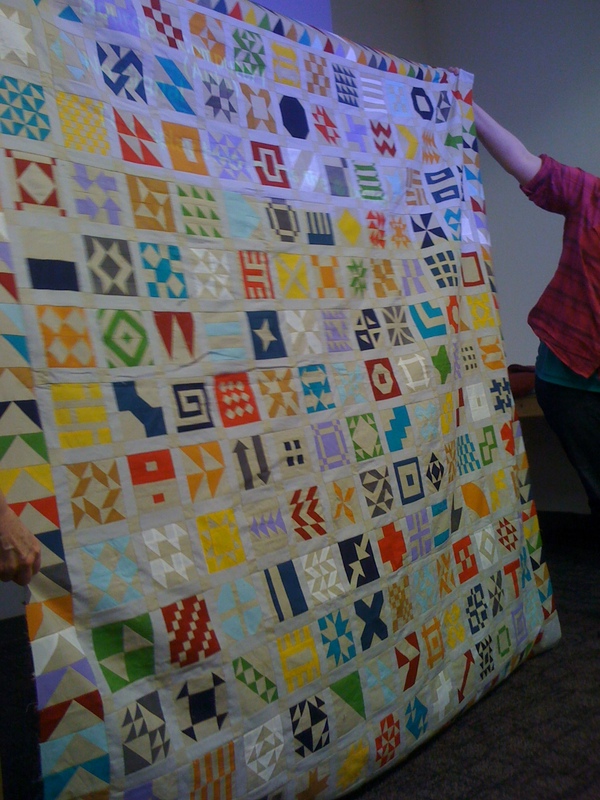 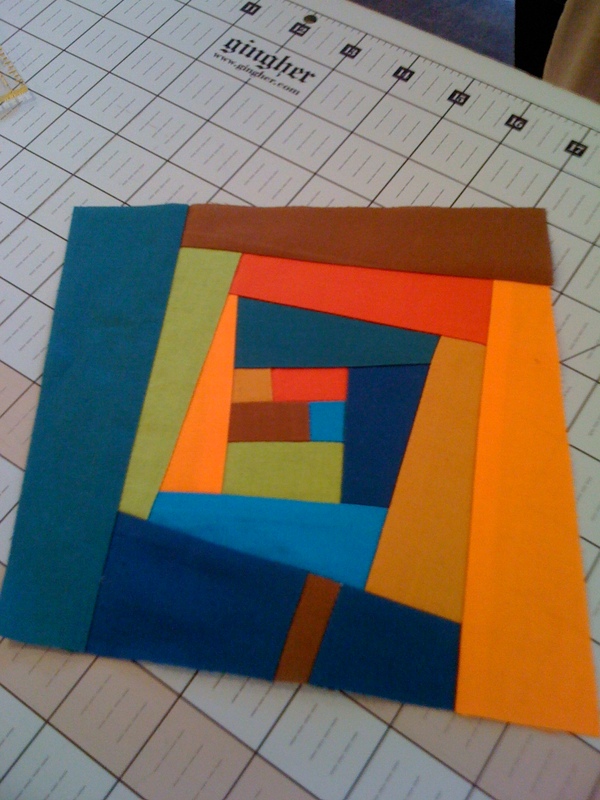 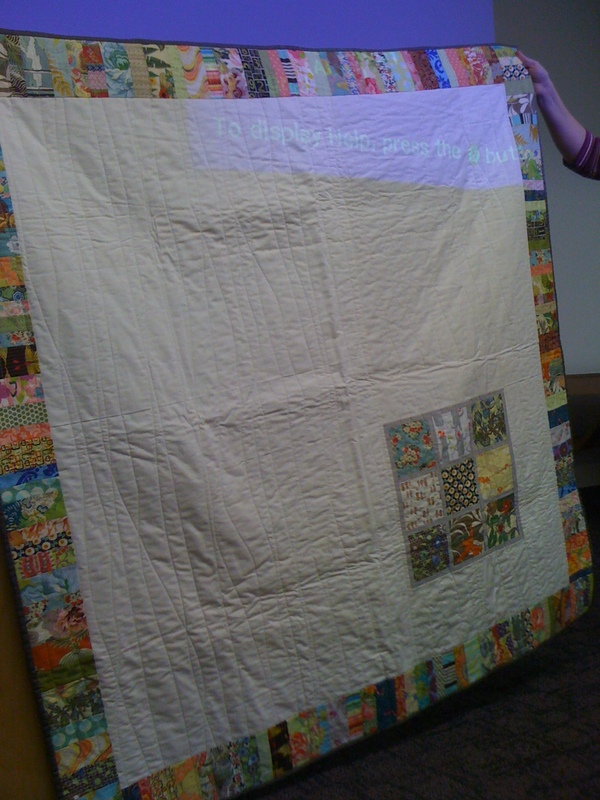 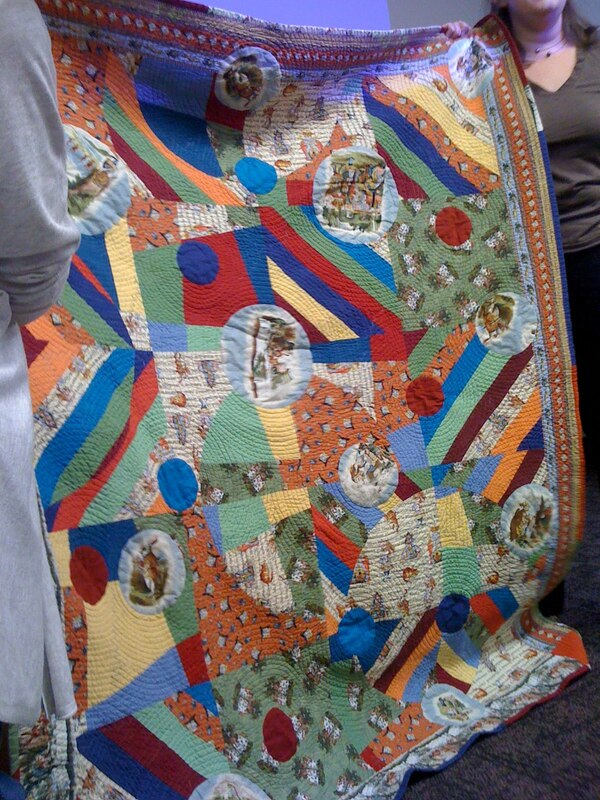 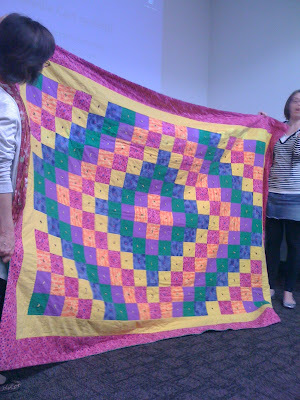 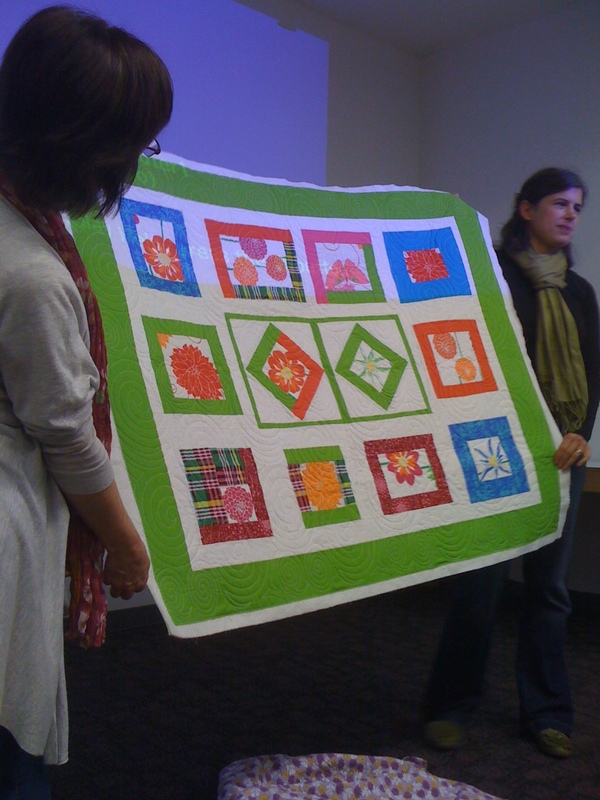 Jen shared this quilt where she played with color and value. ..and Tania's lasted project (remember this from the Sewing Night photos at the top of the post?). 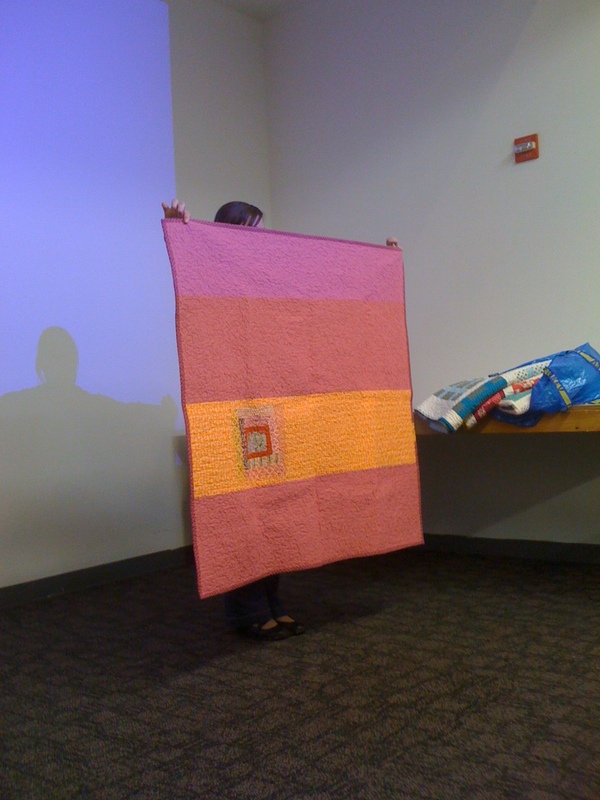 This project was inspired by a Jean Wells class and her book, Intuitive Color and Design (C & T Publishing, 2009), and was finished as an "Off the Wall" quilt (see Jean's book). 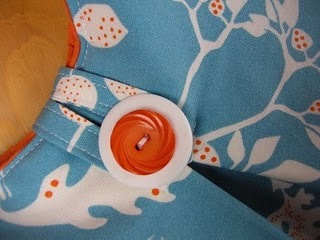 Members still needing buttons can go to the ning site and leave a message on this forum. Marcia for leading the meeting in Jenn's absence. Lisa for confident tech support. PNCA and Modern Domestic for great places to meet, work, and hang out. 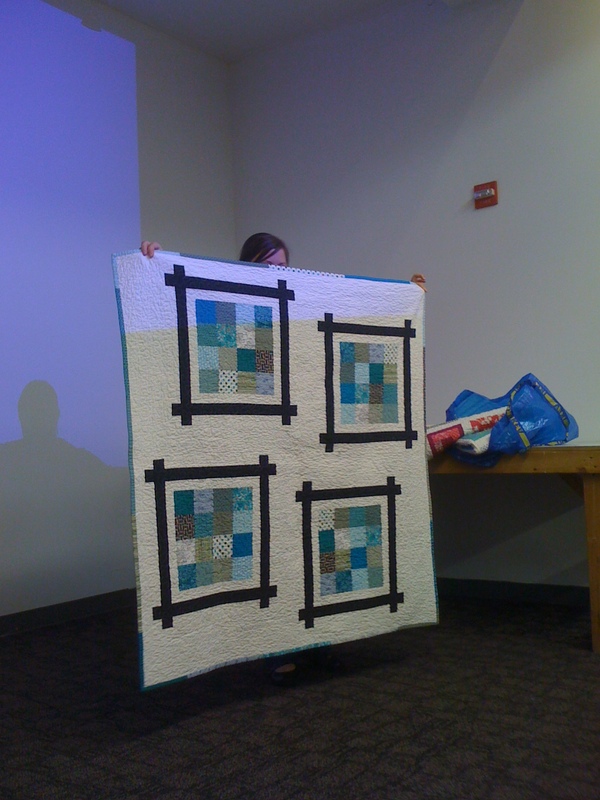 And for everyone's patience with my iPhone pics after losing my camera at the last meeting. 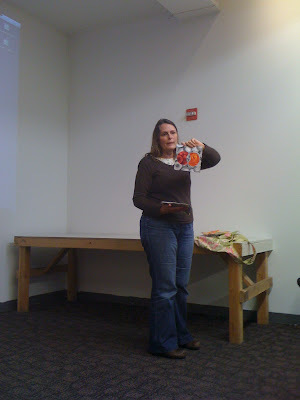 I got a new camera yesterday (a day too late for the meeting), so things should improve equipment-wise (although not necessarily technique-wise ;). 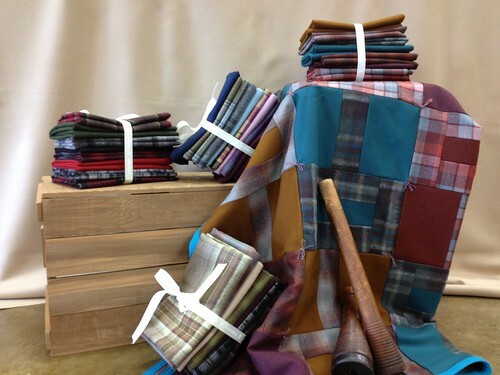 No sewing night at Modern Domestic on the first Saturday due to the Fourth of July. Next meeting Thursday, July 25. 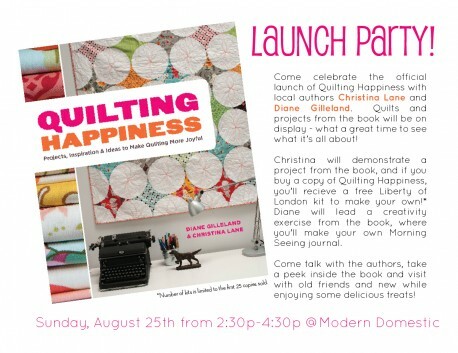 Look for more details coming soon on the ning website events. And last, but not least, I'm thinking we should have a blog giveaway. 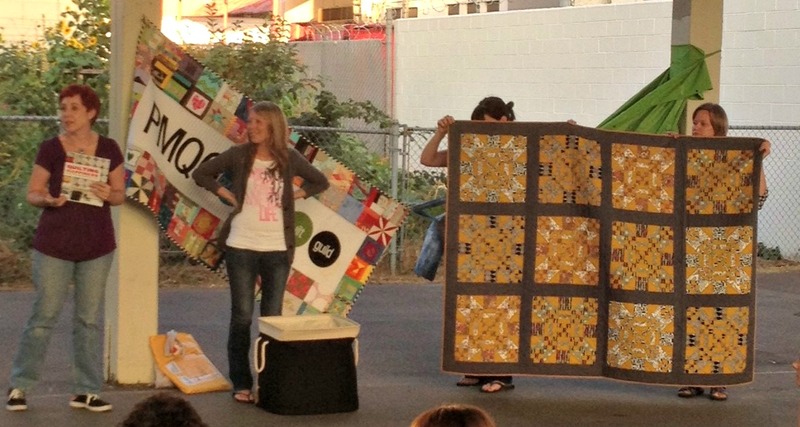 If you have anything you'd like to donate toward that effort I would really appreciate it!